A large airtight storage containers can make unusable storage space usable. Store items in these Iris plastic totes in a damp basement or a humid attic you wouldn't otherwise use. This Iris watertight storage box can hold up to 62.7 quarts (about 15 gallons). 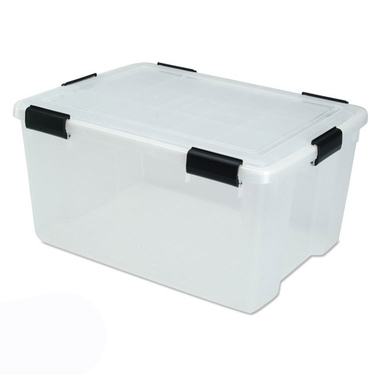 One of the larger Iris airtight containers, this watertight storage box is from the ultimate clear box series. What makes these Iris plastic totes different is that the lid is made with a foam insert which acts as a seal against moisture and air. Large airtight containers like this can give you peace of mind. Feel good about storing valuable items in this airtight storage container. These Iris large airtight containers are made with clear, reinforced plastic. This large Iris watertight storage box is great for blankets, scrapbook and craft supplies, clothes, photos, or anything else that needs to be kept dry. Take advantage of these Iris plastic totes when you need a watertight storage box.Our air-tight containers are made of Archival Grade Polypropylene plastic. They are by nature, Acid Free, Lignin Free, PVC Free and BPA Free. Recycle #5.